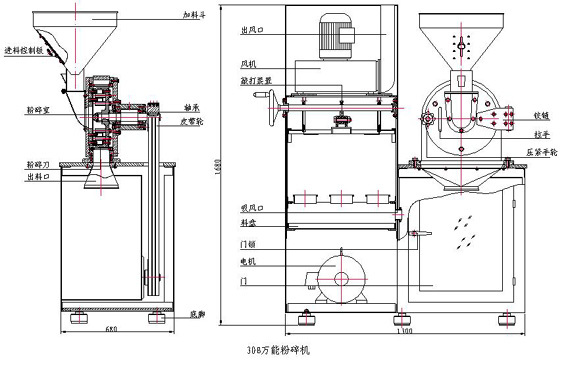 The Pulverizer Set is adapted the vertical low raw material discharging equipment,it makes some raw materials with poor fluidity after broken can be dischanged unblocked and no the phenomenon of accumulated powder. Its principle of work is as follows:when raw material entered into the crushing chamber,it is broken under the impacting of movable and fixed gear disks that are rotated in high speed and then becomes the needed raw material through screen. Its Pulverizer and duster are all made of qualified stainless steel.Its inner wall of the housing is smooth and level being processed through superior technology.Therefore it can make the powder discharging more flowing and is benefit to the work of clean too.The gear disk of high speed and movable teeth are welded through special welding,it makes the teeth is durable,safety and reliable.The machine is in conformity with the requirements of "GMP". Through balance test of gear disk with high speed.It is proved that evne if this machine is rotated at high speed.It is stable and no vibration during the period of ordinary operation.Being adapted the interlock apparatus between gear disk with high speed and driving shaft,it is complete reliable in operation.